Big names in the snack industry are banning together with the hopes of introducing a twist to the traffic light labelling system. The voluntary labelling system, used by supermarkets and brands across the UK, communicates at a glance how unhealthy a food product is based on a colour-coded system. Red, amber and green are used to denote whether a product contains high, medium or low amounts of fat, saturated fat, salt and sugar per 100g/ml. A product with mostly green is going to be much healthier than a product with more red. This system allows consumers to make immediate judgments on whether or not a product is healthy. The colour designation for a product’s fat, saturated fat, sugar and salt levels are determined based on nutrient profiles put together by the Food Standards Agency (FSA). 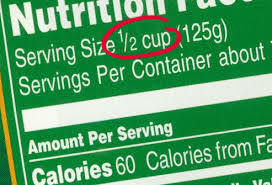 On the surface, altering the traffic light label for a serving size rather than a measurement is a good way to connect with consumers on an understandable level. Seeing the value for a serving size is tangible when compared to the hard-to-interpret 100g/ml. Undoubtedly the numbers for fat, saturated fat, sugar and salt will be more realistic and allow consumers to determine how much is okay to eat. However, going off of portion sizes opens the system up to manipulation. A company can use very small, unrealistic portion sizes for their products, allowing them to label them with green or amber rather than a well-deserved red. 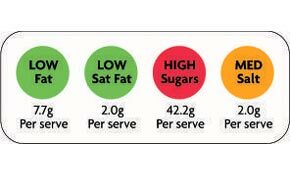 It’s worth noting that the traffic light labelling scheme in the UK measures the nutrients of 100 g/ml of a food product while the nutrition label on-pack gives nutrients based on portion sizes. The discrepancy is confusing and unnecessary. Changing to portion sizes may make it easier to consumers to glean more valuable information from the pack labelling. A taskforce has been put together to fight for these junk food giants’ end goal – “to put in place a robust nutrition labelling scheme that helps consumers make balanced and mindful choices.” They hope to work with European Heart Network (EHN) and the European Consumer Organisation (BEUC) to enact this new system of labelling.